It was so fulfilling to hear Roy say how he has used SugarBytes to supplement his knowledge of sugar cane farming. That simple statement makes it all worthwhile – when a man who has been in the industry for 3 generations, says he has learnt from the articles, it’s a rich reward. Thank you, Roy, for bringing us your story and investing your knowledge and experiences so that others can learn. I hope this is inspiration for any farmers unsure about ‘putting themselves out there’ in a SugarBytes article: Every one of you holds value for at least one farmer out there, and if that’s all your story does – enlighten, inspire or encourage just one farmer – isn’t that worth it? Farming in South Africa is tough. 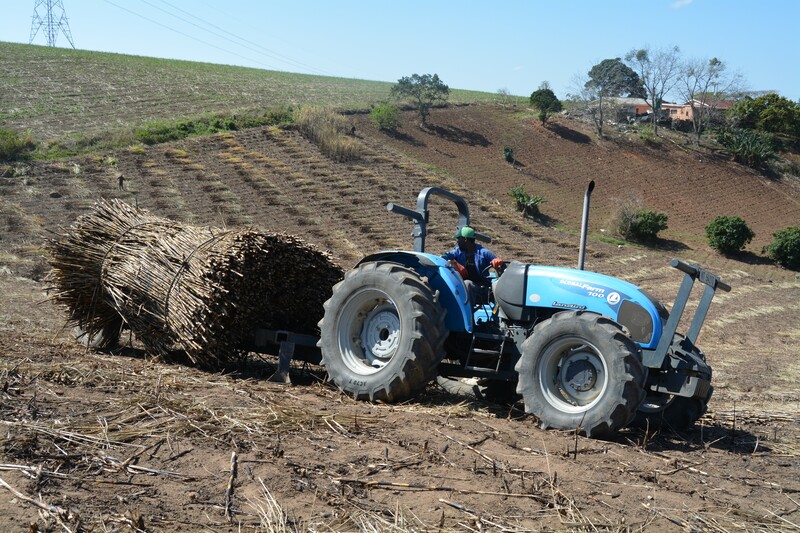 Farming SUGARCANE in South Africa, right now, is tougherer (credits to Toyota ) so, when we have the opportunity to support each other, it shouldn’t be missed! Because of this investment that Roy has made in the administration of the industry, his farm has required supplementary leadership. Pratish, Roy’s eldest son, has taken up this role. Roy explains that Pratish does all the hard work while he, himself, gets all the glory. Pratish tried to sit through the interview with Roy and I but, clearly, we’re way less appealing than his fields, and we lost his attention early on. Farming requires a passion, but more than that it requires versatility. You have to adapt to a broad spectrum of challenges. This requirement is amplified in a small-scale operation, like Sharma Sugar. There is no money for specialists – YOU ARE IT! You are mechanic, agronomist and financial director. Roy explains that herein lies one of the problems with land redistribution: people with neither the agricultural upbringing nor education are trying to run operations that are challenging to start with. One of the greatest tests is money management. People, like Roy, raised on a small-scale farm, know all about tight belts, ‘saving for the rainy days’ and management of seasonal income. But, for people transplanted into this environment, the temptation to ‘spend it all’ is overwhelming. As already mentioned, farming is TOUGH and unforgiving – even small mistakes can lead to disaster. His great grandfather arrived in South Africa at the same time as the indentured labour from India. He was with the British Army. He settled in this area around 1881 and worked on a farm “Maurica Estate”. Roy’s grandfather, whom he remembers as a Blacksmith and Engineer, had a workshop on the Main Road to Tongaat where he built and maintained horse-drawn wagons which was the main mode of transport at the time. All the skills required to make this a successful business were acquired without any formal training – testament to the entrepreneurial determination of the Sharmas. Roy’s dad had to give up schooling in Std. 1 to assist his father in building their house. He never went back to school and continued work on the family farm once the house was complete. This gives us some understanding that he was perhaps a little more prepared for his arranged marriage (at age 14) than our modern children would have been. Roy’s grandfather was a very prominent personality in this area, taking a keen interest in all matters related to culture and education. He even donated land to the community, upon which he built a temple. The temple, built in 1936, can be seen below, from the veranda of Roy’s home. Tragedy struck the family in 1962 when Roy’s father passed away. He left his wife with 10 children; Roy was the 9th and only 7 years old. His eldest brother had to leave university to help care for his younger siblings. He did this well, supporting his mother in getting all the children a solid education. Roy says he didn’t do very well in matric and skipped tertiary education. His first job was in Pinetown, earning R18 per week as a storeman. He planned a corporate life for himself but when the brother who had helped raise him took ill, he had to return to the farm. 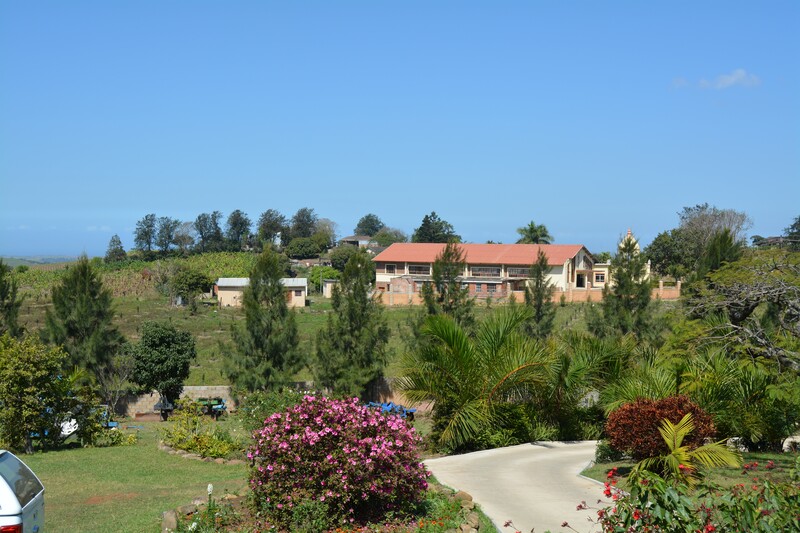 Shortly thereafter his brother passed away, and Roy found himself reliant on this 20-hectare family farm for income; he soon realised that it wasn’t enough. He had to expand or go back into the corporate world. He chose farming and struggled through the next few years. In 1996, land reform became a thing, with millers selling off some of their farms to previously disadvantaged individuals. Through this scheme, Roy bought 90 hectares from Tongaat Hulett. He had to commit to a bond of R1mill; Ithala Bank was very kind in facilitating this process. In 2004 Roy was able to double the size of his land when a neighbour’s farm went on the market. In 2012 Pratish joined the operation and the farm needed to grow to accommodate this additional draw. This is when Sharma Sugar took up sharecropping contracts on offer. I learnt about this set up during this interview and it might be interesting for others of you who may not know exactly what this term means. When millers implemented their reform programmes and sold off some of their land to previously disadvantaged farmers, they did it in blocks of around 70 hectares with the understanding that not all the farmers would be successful, and their neighbours would be able to pick up land around them and build more commercially-viable size farms. When these predicted failures happened, some white farmers stepped into the buyers’ ring and that didn’t work for government who then placed a moratorium on the sales of these farms lest they find a reversal of the land reform programme. So, unsuccessful farmers were stuck with their land, millers’ sugar supplies dipped, neighbouring farmers couldn’t grow and banks, who had financed the deals, stood to lose their money. Sharecropping was the solution. In this arrangement the miller leases the farm back from the owner and then contracts a suitable farmer to work the land. That farmer (in this case Sharma Sugar) pays 12% of his income from that land to the miller. The miller pays the owner 10%. The miller has an arrangement with the bank to keep them happy. This way, the land doesn’t lie idle, the owner has some relief from his failed operation, the miller gets cane into the mill, the bank gets some return on their investment, neighbouring farmers can increase their scale and government succeeds in limiting white ownership of land. Almost an acceptable solution … and one that, from Sharma Sugar’s perspective, works well. 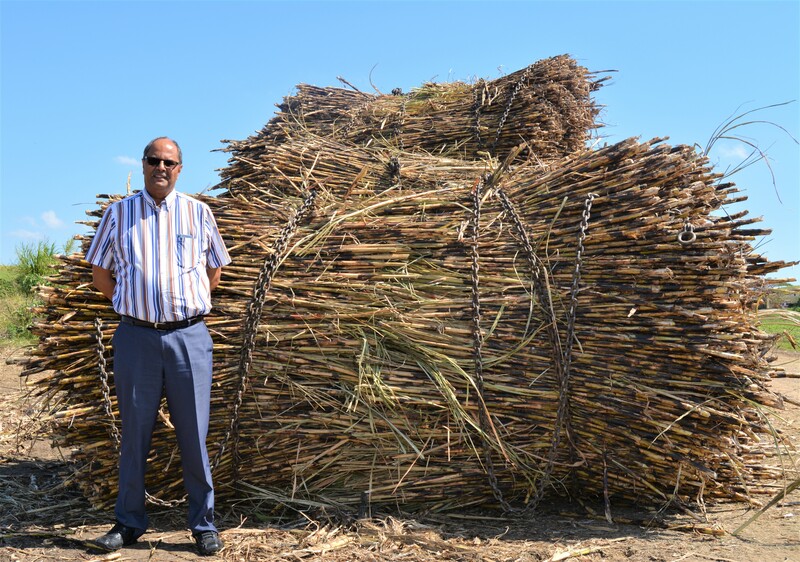 The total area under cane, in the Sharma Sugar operation currently, is 400 hectares. They deliver 17 000 tonnes to the mill annually. Besides being Vice President of the WABCG, Roy is also on the SASA council and a member of the Canegrowers board. Roy’s involvement in the administration of the industry was borne from his desire to do the very best he can as a small-scale grower. He wanted to fill the gap he felt the lack of tertiary education had left. Although the duties take him off the farm, he has learnt to rely heavily on his staff and they support him, while he spends time gaining a deeper understanding of the industry in which they operated. He values the opportunity to have an insight into the inner workings of the industry. Roy will retire as Vice President of the WABCG in 2019. He has found this body particularly beneficial as private farmers from 33 countries engage on issues like environmental concerns, diversification and climate change. Exposure in this group gives him an invaluable and fascinating world perspective. Roy is also involved in the International Sugar Organisation which includes governments and millers and therefore gives him another layer to his ‘education’. Obviously, I had to ask when on earth he finds time to farm at all! Four hours every morning are spent in his fields before 8am (this is reduced to 3 hours during winter) and Pratish is on the farm all day so … it can be done! 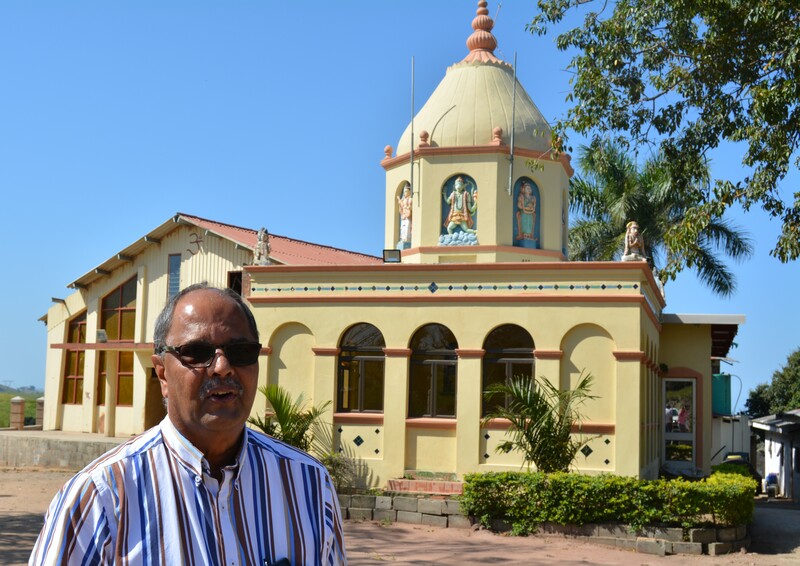 Sharma Sugar is not located in the best cane growing country, even though this is the birthplace of many sugar barons and the site of the very first South African sugar mill, down the road, in Compensation. They seem to struggle with almost every pest known to sugar. I do get the distinct impression though, that Roy has a renewed interest in making the most of his land. He recently planted 10 hectares of macs but will not allow this to reduce the quota he delivers to the mill. That means getting another 450 tonnes out of the land still under sugar … how does he plan to increase yields? Roy explains that small scale farmers are no strangers to growing a variety of crops – it is an essential element in them being able to afford the establishment of longer term crops. So, he continues with this practice, usually growing veggies. More recently, he’s also started fallowing some fields by giving them a complete rest from all crops for a short period. Combined with this, he’s learning more about green manuring. Besides being good organic matter for the soil, there are some plants that can actually be put to work while they’re growing eg: Roy has used winter oats to suppress certain weeds and creeping grasses. Tillage radish effectively helped alleviate soil compaction in one of his particularly hard fields. 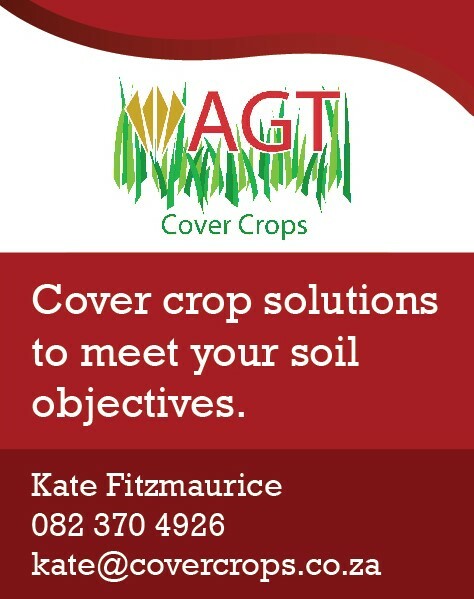 Kate Fitzmaurice, from AGT Cover Crops, has advised and supplied him in this area. Sharma Sugar ripen extensively with Ethapon and Fusilade piggybacked. They find the best planning and application is done independently from the mill. 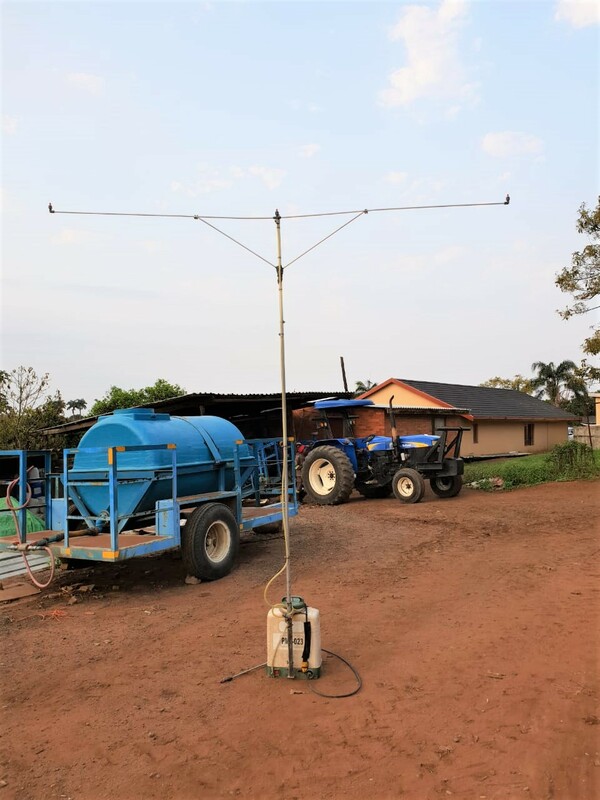 The chemicals are applied manually with a modified knapsack sprayer with a boom. The labour walks through the field and the battery-operated sprayers dispense the chemicals across three rows. 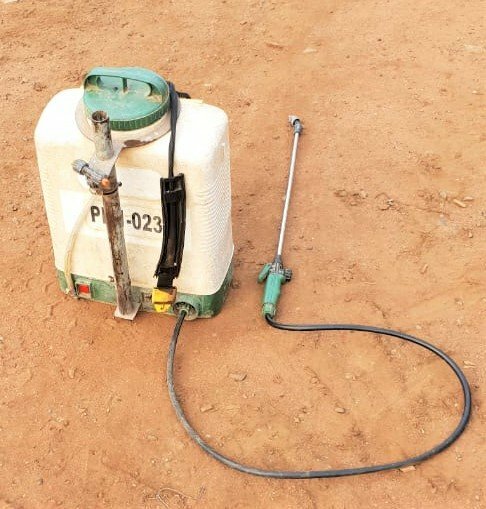 Slightly different but still battery-operated knapsack sprayers are also used to apply pesticides. These ones have a fan that helps to ‘swirl’ the leaves facilitating the effective application of the poison. Eldana is a dire problem in this area, especially in drier years, and demands careful attention. P&D inspects and, depending on the results, Roy usually has to spray Coragen, followed up with a dose of Fastac. Thrips and yellow aphids are also serious challenges currently. Allice is used to fight the Yellow Aphids but they need to be spotted in time; taking your eye off the ball for a moment sometimes spells disaster. And if that wasn’t enough to deal with, Roy also has to watch out for Rust. This is variety-specific though and he uses Abacus to control it. 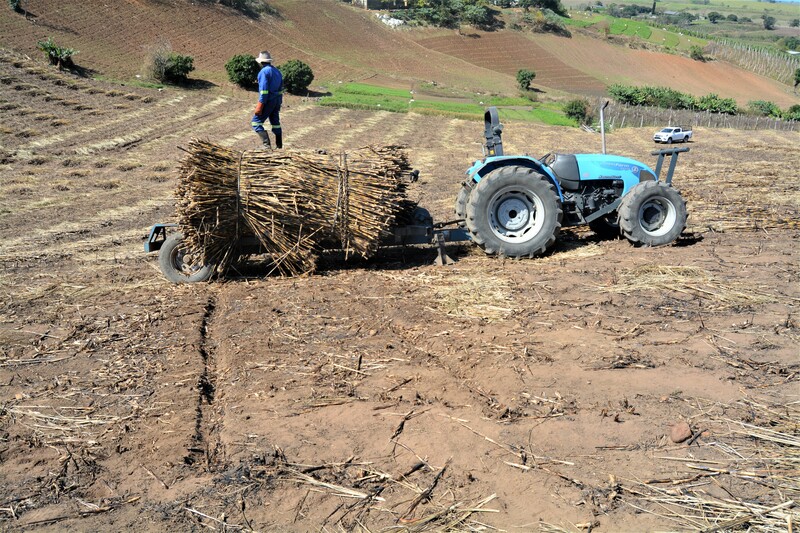 As with most sugar farmers, Roy has a plan of which fields will be harvested when and, integrated into this is a plough out plan that affects 10% of the land under cane annually. Flexibility is key, allowing space to remove fields that are under-performing prematurely and extending the life of those that are exceeding expectations. Roy emphasises that the quality of seedcane you use is of paramount importance. In this area, seedcane has even been known to come with Eldana! He grows some of his own (seedcane, not Eldana ) but is also always open to new varieties. Right now, N51 and N52 are performing well but he’s yet to see whether they have ‘legs’. 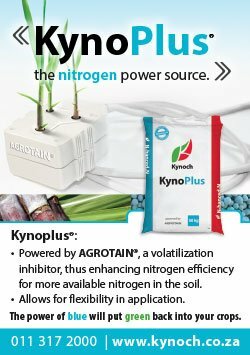 N48 is also doing well and N55 is good as long as it is in a deep soil. Varieties he is getting rid of are N31 because of its high fibre content and the degazetting of N376 means he has to have all of that out by 2020. Although the current modus operandi at Sharma Sugar is to burn, Roy is interested in investigating green cane harvesting in the near future. He believes that, as farmers, they need to leave the soil in the same, if not better, condition than when they got it. With this weighing heavily on his conscience he plans to consider the practice but fears it might be a challenge when human nature prioritises profit and productivity over long term planet prosperity and he has to convince Pratish that it’s the right way to head. Some parts of the farm are quite steep. 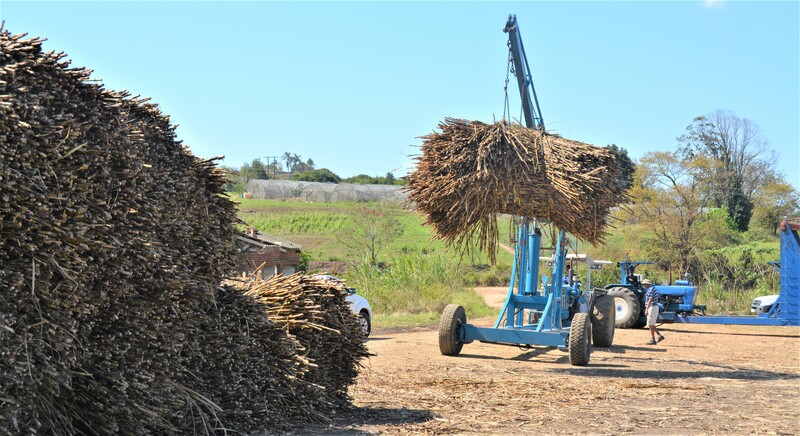 This fact, together with the issues around soil compaction and in-field loading, means that they have chosen to use the cut & stack method of loading the harvested cane. 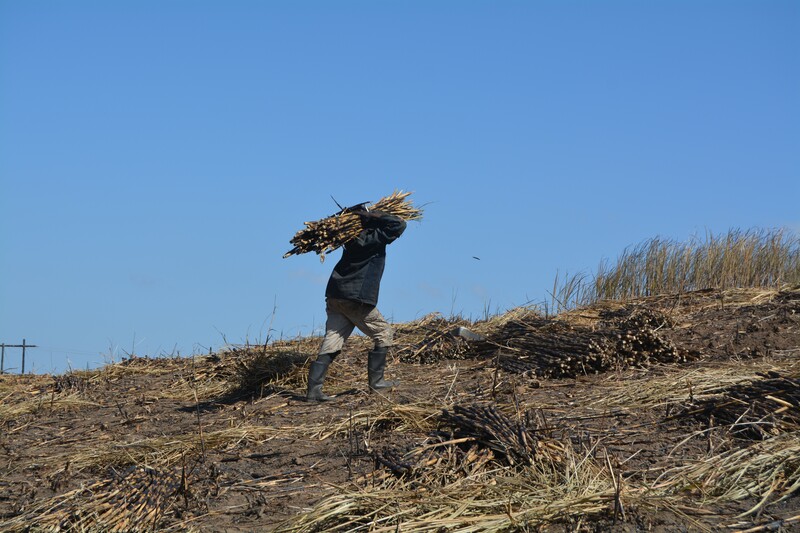 Cutters lie the cane down in small bundles / windrows as seen above, and then they top it before collecting it up and placing it in larger bundles, ready for the side-loading trailers to collect. Another item on Roy’s ‘to-do’ list is to try and educate the cutters to stop topping in bundles. It is an inaccurate way of removing trash, affecting RV and fibre count. The bundles are then transported to a loading zone where they are weighed with a crane loader. 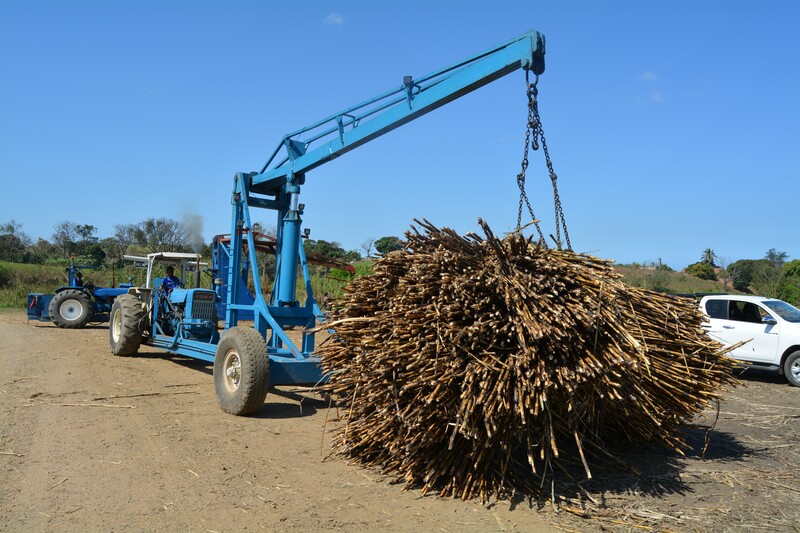 A haulage contractor gets the cane to the mill. His 25 permanent employees are joined by another 25 in-season. Maximise profits by saving on costs. Assess all areas to see where you can save money eg: by doing own books and doing minor repairs yourself. It’s not always possible – Roy would love to handle his own haulage but the cost of the equipment is prohibitive for his volumes – but always be on the lookout for cost-saving opportunities. There’s always room for improvement. Roy surprised me with his student-mentality. A man of his standing is often more of a ‘know-it-all”. On the contrary, Roy seems to enjoy the fact that he still has so much to improve on. This was illustrated when we discussed his diversification into macs. Having planted 10 hectares of sugarcane land to macs doesn’t mean he’s going to allow his cane supply to dip. He is committed to increase yields to cover the 450 tonnes potential shortfall. Some areas he will be focusing on are soil health and nematodes management (particularly in these sandy soils). He enthusiastically listens to any advice on how to improve. Thank you, Roy, for the time you took from your already over-extended schedule to host me on your farm and share your journey so openly. I hope others are inspired by your capacity and curiosity. Definitely the best dressed farmer interviewed thus far.